Help us build an exciting new future for the GSAC! Gas Station Arts Centre hasn't added a story. It's time for a change, Winnipeg! For over 30 years, the Gas Station Arts Centre has been a keystone of the Winnipeg Arts community. But it's gotten old, and the building is no longer adequately serving its public. We are launching a major redevelopment with exciting new changes including affordable housing, parking, and of course, a charming 300 seat theatre that will continue to support and facilitate innovation and creativity in the arts, with a special focus on being an artist’s “first stage”. But in the meantime, the old building will come down. 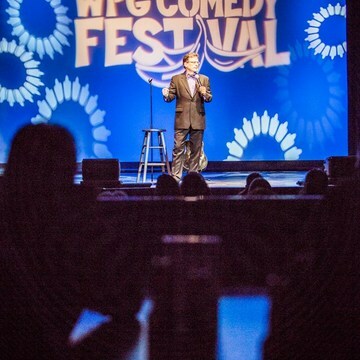 While the new building goes up, we need office space, and more importantly, we need to continue to serve our clients and the Winnipeg Comedy Festival as best as possible during this exciting time. As you know, even raising money costs money. Please show your love for the GSAC by donating now! Once you've donated what you can, please take the time to share this campaign with your friends and networks. Every bit helps! This is your way of helping us navigate the waters while we build a bright future for the Gas Station Arts Centre. ALL DONATIONS of $25 or more will recieve a tax reciept. 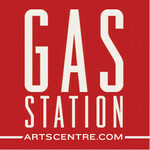 Gas Station Arts Centre hasn't posted any updates yet. Be acknowledged as a GSAC Superstar; get listed on our website Initiatives page as a supporter of our project! 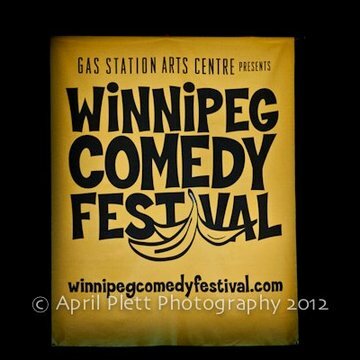 See your name up in, well, not lights but in bold print on a lovely big sign displayed at all the 2015 Winnipeg Comedy Festival galas! 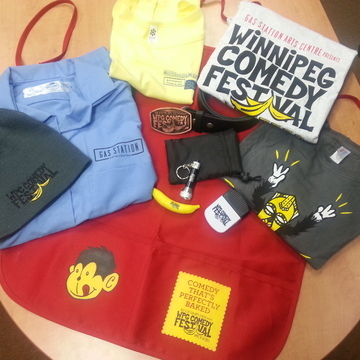 Choose from two archival GSAC and Winnipeg Comedy Festival merch items. T-shirts, banana-shaped USB key, belt buckles and lots of other funky fun stuff to choose from! 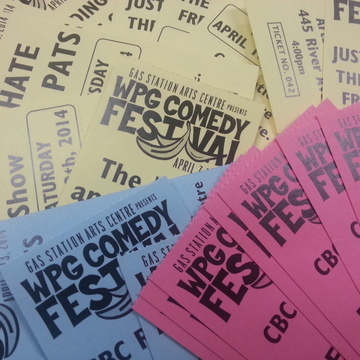 Get tickets to one of Winnipeg's funniest annual events - choose a pair of tickets to any of our 2015 Winnipeg Comedy Festival gala shows. Value of $80! 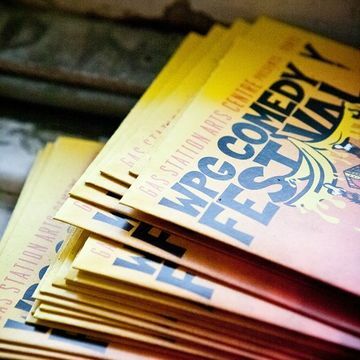 Have your name listed in the 2015 Winnipeg Comedy Festival program, distributed to all 12,000 festival attendees! If that doesn't boost your social media stats, nothing will! 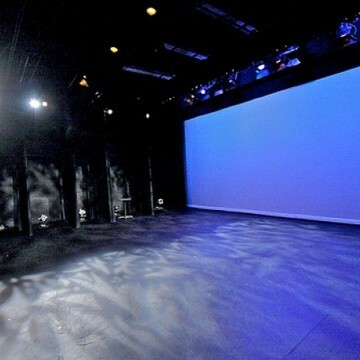 Personal use of Gas Station Arts Centre for one evening - basically, you get a one night rental to host a performance, hold a ping pong tournament on stage, or or hold a gaming party for 232 of your very closest friends! 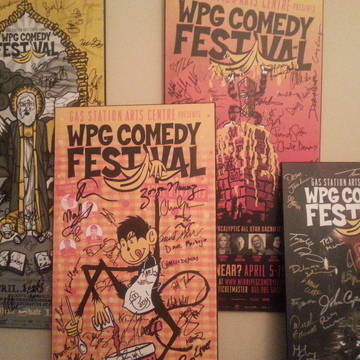 Get an archival kitchen stool signed by Winnipeg Comedy Festival comedians! 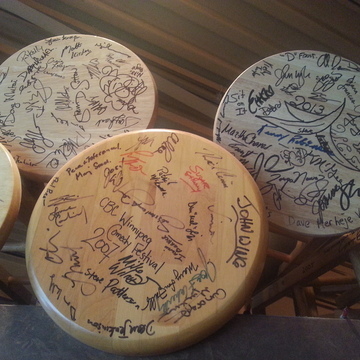 Each year we ask the festival comedians to sign a stand-up stool that we keep in our archives. Only 4 available! The "Look who's a comedian now"
Do you have the Hutspa to get up on the stage? Well, here’s your opportunity! Perform live on stage during a 2015 Winnipeg Comedy Festival or GSAC season show. 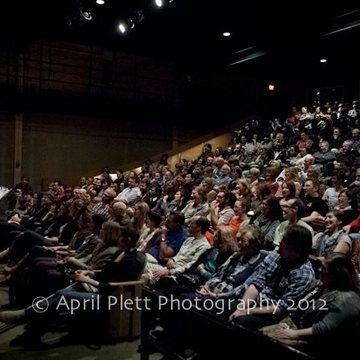 The contributor at this level will get a private comedy show with 200 friends at the GSAC during the 2015 Winnipeg Comedy Festival! This could be a corporate event, or just a really awesome night for you and 200 of your closest friends! 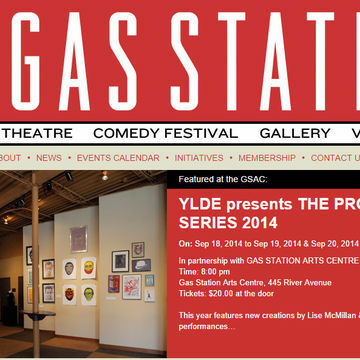 Gas Station Arts Centre is managing the funds for this campaign. Gas Station Arts Centre is a verified organization.